So I have stumbled upon a set of Cizek 2s for fairly short money. They appear to be in fairly good shape cosmetically, but are clearly in need of re-foaming at least. I have done a little research on this line and model and it appears to be a fairly respected line and model. What I haven't been able to quantify is the style of the sound this line makes. Very often I see the East coast or West coast reference, but haven't seen that with these. I am a fan of the East coast sound, AR is hand's down my favorite brand of vintage speakers for example. I see the set of 2s as bookshelf speakers in the office maybe, or something like that. Not necessarily in the main system. If I pick these up, I know about the surrounds, but what else can I expect to need to do, or should I do to rejuvenate these specimens? 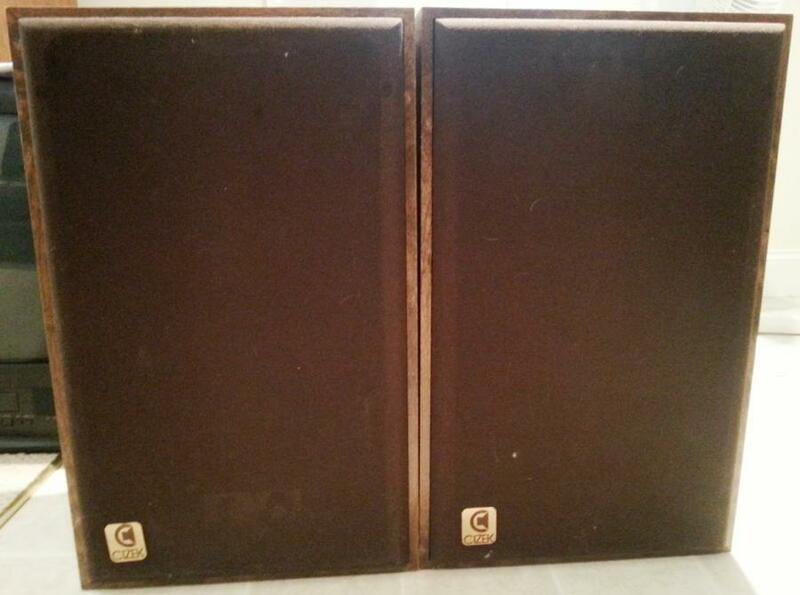 The cabinets do look good, and I just feel like this is a set I should snag as they do appear to be not so plentiful. But with "not so plentiful" comes not so many interested, not so much info and the potential for parts that are unobtainable. so in the end, once I saw the woofers I backed away a bit and offered $100. He responded and said he had sold them to someone else for $160. I get the impression they are probably still in his basement. 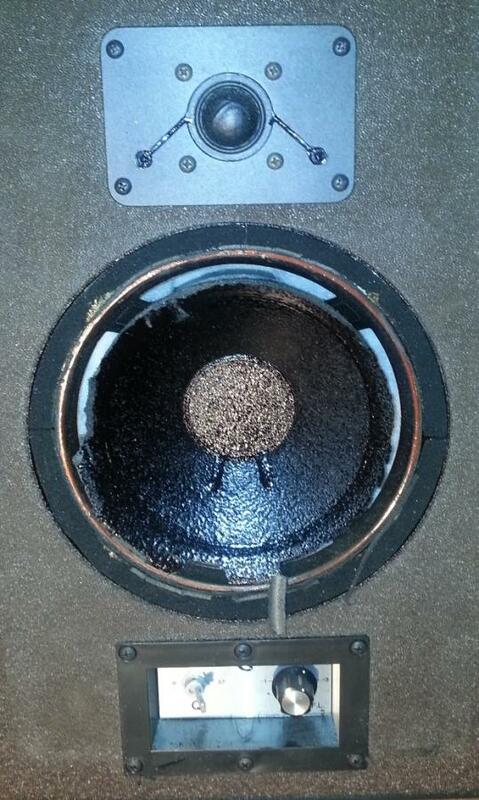 I don't know who made their woofers--I had Bill LeGall work on my KA-1 woofs. The tweeters are the once-ubiquitous Peerless K010DT silk dome drivers that were used in Polk, Infinity, ADS, Bozak and others. 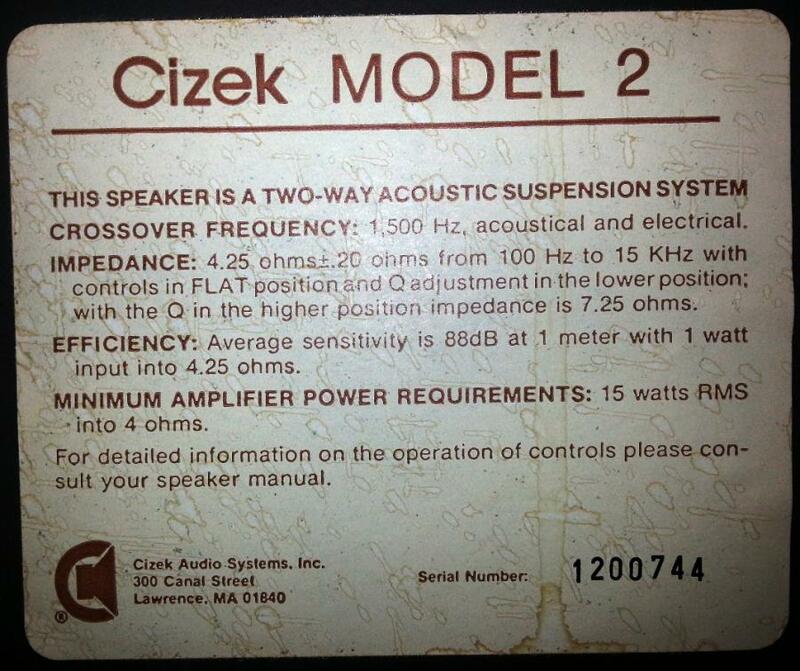 Cizeks were known for their flat impedance levels across the bandwidth and consequently the crossovers were pretty complex. Early Cizeks were made in Roy's basement in Indiana (IIRC), later in Mass. I don't think he was much of a businessman and different incarnations of the company apparently went bust. His final line was the "High Tech Aspirin" (go figure) when the company was based in CA. Ironically, although Cizeks were praised for their sound and the fact that Roy was blind was sometimes mentioned in this context, I think many of the speakers are visually stunning. The ones you considered are, I believe real wood veneer. My KA-1s are solid Hawaiian koa wood and my HTAs are solid oak. Nice. $160 may seem a bit steep for vintage speakers in need of TLC but OTOH after refoaming, recapping and refinishing they would be pretty terrific. Anyway... sorry I did not respond sooner. Hi Kent and thanx. I was real close to pulling the trigger, but I have enough projects at the moment. The part that really bugged me was the seller telling me that they were in need of no repairs. If he had been honest about it from the start I might have been more inclined to move on them. I probably should have as they are unique and not all that plentiful, maybe next time. but I have enough projects at the moment. I know what THAT's like! And if the seller told you they were not in need of repair that is a red flag. It may have been ignorance on his part but if he was playing them in that condition he could have ruined the woofers. And if it had been just an honest mistake you would think that once he saw the condition of the woofers he would have dropped the price. Probably just as well you passed. I confirm all JKent says. I add that Cizek Two are in particular the less bass-rich speakers of the whole production of Cizek Audio System. The only one that probably need Sub-Woofer MG27. I'm, Sergio from Italy owner since 1982 of a pair of Model 3 and it's a pleasure to have a chance to meet here a lot of people that still restoring the Cizek models, looking for the original sound of these great speakers. I'm doing the same so i'm collecting any informations concerning the customize process (by Cizek factory) of the great tweeter Peerless KO10DT/8 or DT115 before the installation in the cabinet. That's because i have two spare pairs of tweeter that i bought many years ago from Coral (Peerless italian dealer) and I would like to setup these spare parts as a real backup of the original piece modified by Cizek. Any info about that can be really useful !